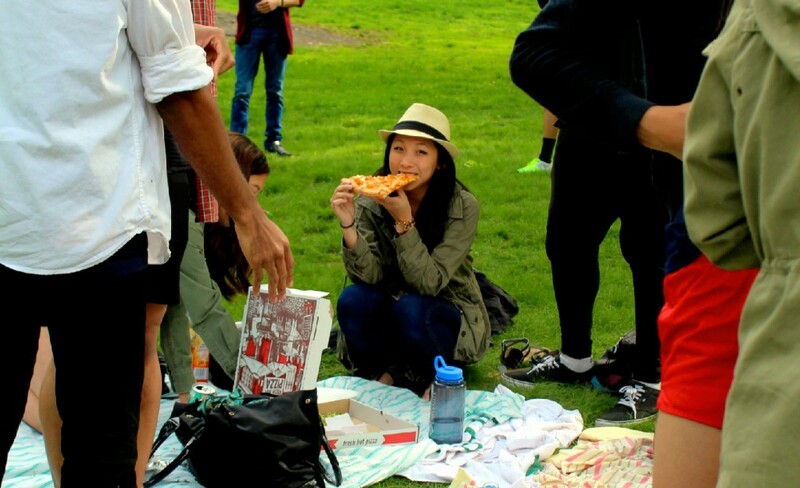 Just before summer kicked off, EPIC Motion brought together our alumni and current company members for a picnic in Central Park. It was a spring day full of nostalgia, hugs, chips, one football, two Aarons dancing to Beyoncé, and unnecessary pollen in the air—enough to make Betsy leave early. Ever since I joined EPIC Motion in 2009, I have always felt a great joy from reconnecting with the generations of dancers that have been a part of this company. There’s something to be said about the bond created when you spend three days per week in the studio sweating it out with a group of 25+ twenty-somethings for months on end and experience the ecstasy of performing on stage together. One thing I love about EPIC Motion has always been the people. Every season my heart breaks a little when people move on (cue “Graduation” by Vitamin C), but it reminds me to remember to enjoy these experiences in the moment—it doesn’t last forever! Check out some of the moments from the picnic I caught on film below! Fun Fact: There have been over 125 dancers in EPIC Motion Dance Company since it was founded in 2008. This September we are seeking some fresh, new talent to join us as we enter our seventh year. We are looking for dancers that move in any style, to any genre of music. We are looking for those who love to push themselves for their art and share it with others. 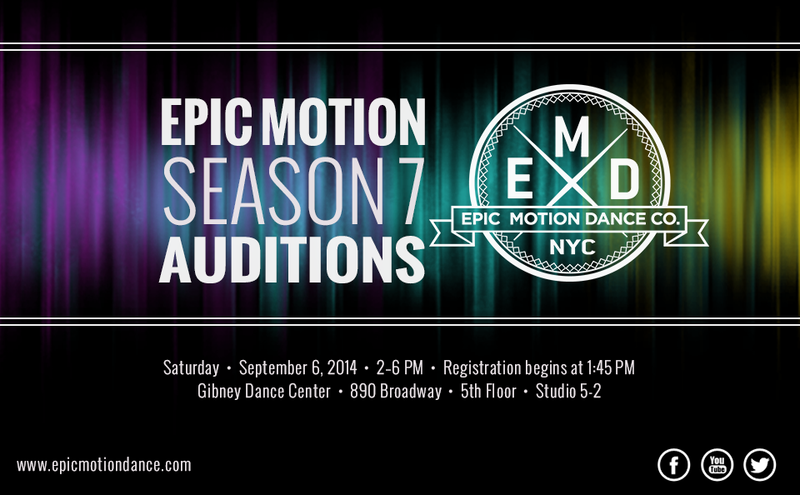 If that sounds like you, then we welcome you to show us your energy and passion at our Season 7 auditions! Please complete and submit the audition form to epic.m.dance@gmail.com along with the HEADSHOT REQUIREMENT (does not need to be professional) and up to two OPTIONAL video links prior to attending auditions. If you choose not to pre-register please arrive early to complete the registration process in person in time for warmup. This is a CLOSED AUDITION and not a company class. We kindly ask that you attend only if you would like to join the company. Please email us at epic.m.dance@gmail.com or message us on Facebook/Twitter if you have any questions or concerns. EPIC Motion is an award-winning dance company based in New York City featuring a collective of dancers with the common desire to express themselves on a larger stage outside the dance studio. 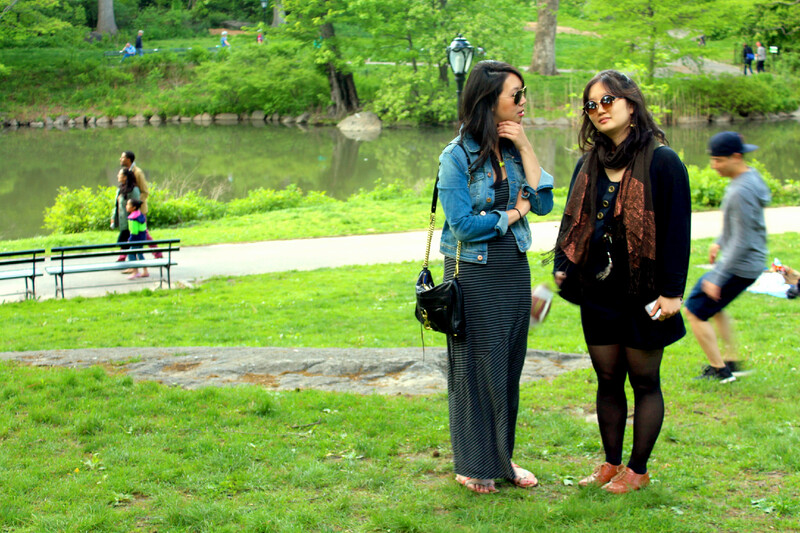 Our members embrace their individuality as the primary force behind their innovative movement. Through frequent rehearsals, performances and classes we hope to advance beyond our limits as dancers while growing together as a family. 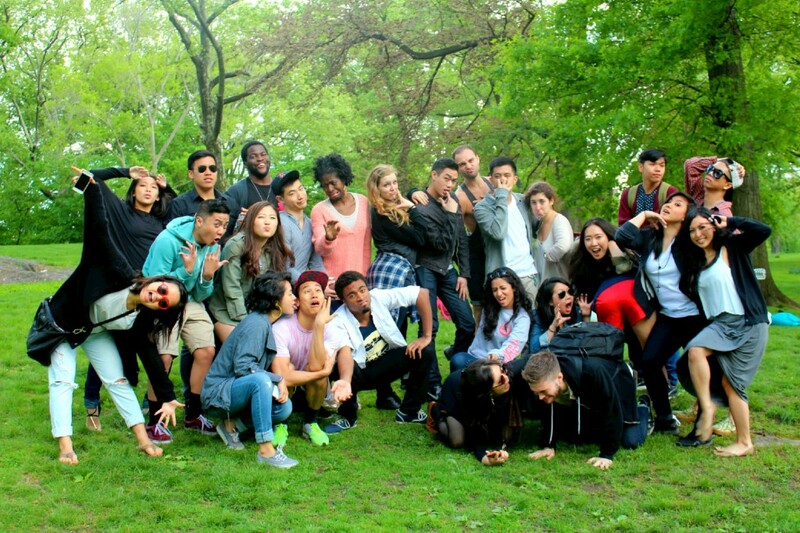 Learn more about our 2014 Summer Intensives choreographers! 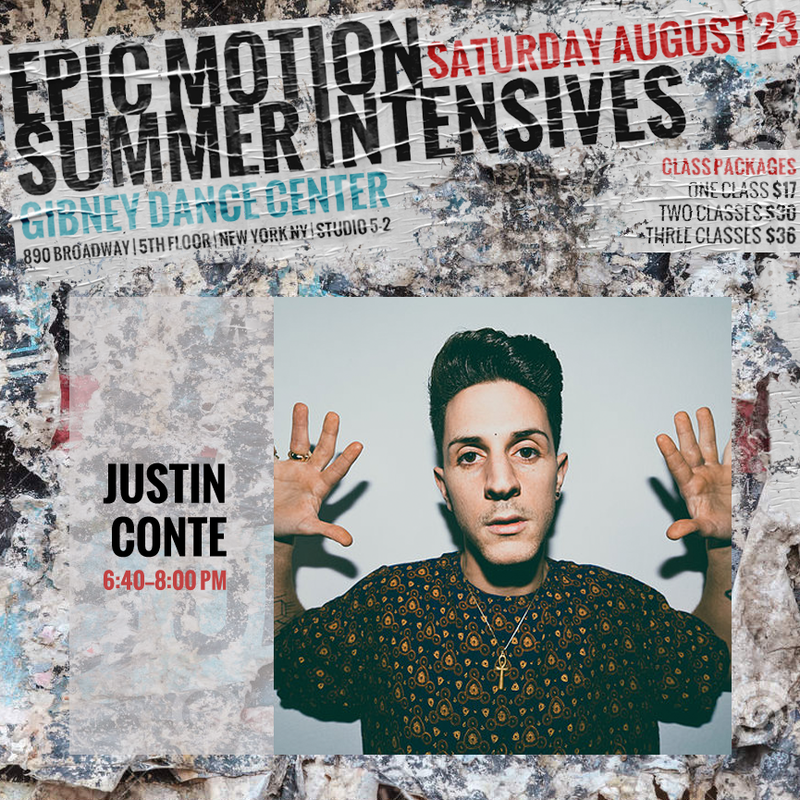 You don’t want to miss this event happening Saturday, August 23, 4-8 PM at Gibney Dance Center (890 Broadway), Studio 5-2! 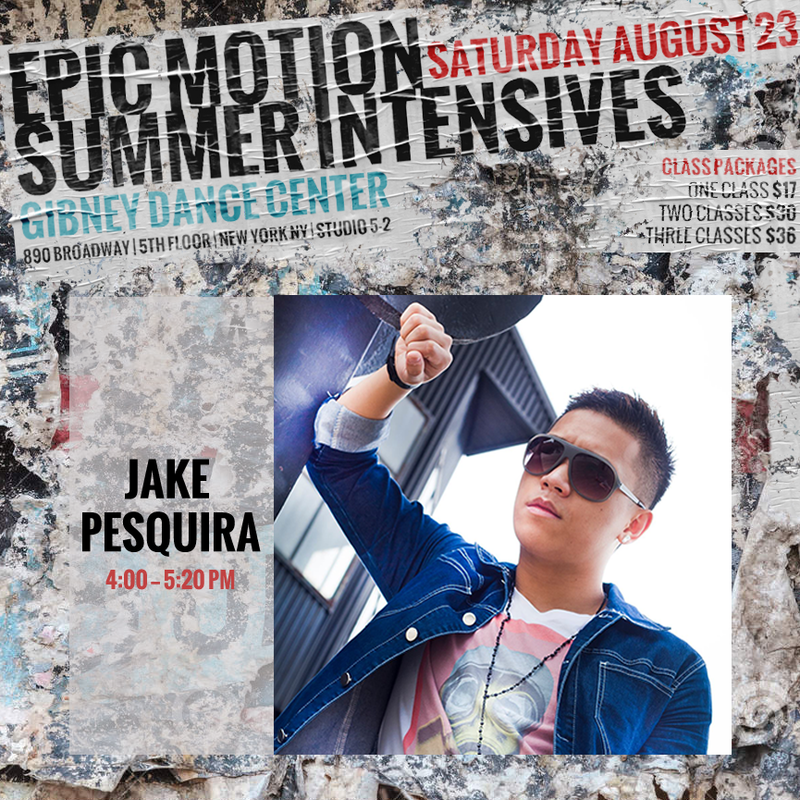 Born in Cebu, Philippines and raised in Queens, NY, Jake Pesquira has been experienced as a former Co-founder and Co-Director for FLO Dance Team (NY/NJ), Fr3sh Dance Company (NJ) Season 5 alumnus, former Co-founder and Executive Director for DynamiQ Faction (Queens), EPIC Motion Dance Company (NY) alumnus, one of the ‘foreign’ members of Mischief Makers (LA) directed by Beau Fournier from ABDC’s Fanny Pak, and currently a dancer and choreographer for Rhythm City Dance Company (NY) led by Alonzo Williams. Taking the stage at many showcases, competitions, he also had the opportunity to perform both local and national TV on QPTV (Queens Public Television) and on Wild Out Wednesday (W.O.W.) on BET network, and MTV’s Made. With the utmost respect and gratitude, he’s been blessed to work on several projects for amazing choreographers such as Alonzo Williams, Dennis Caindec, Neil Schwartz, and Adrian Causing, performing at Angelica Salem Benefit Concert, East Coast Dance Concert (ECDC), Carnival (Choreographer’s Ball) NY, and Prelude East Coast Dance Competition. He has also worked with major companies participating in the “Bronx Flava” ad campaign with Pepsi, and Walmart among other major artists such as Black Eyed Peas, Alicia Keys, and Will Smith. Jake began presenting his choreography in collaboration with Dion Dennis in Frankie Zulferino’s music video “Last Man on Earth,” and at Carnival NYC showcasing as finale of the night in November 2012. Currently, Jake is working closely with Rhythm City Entertainment and with ABC’s “The Voice” RnB/Pop artist “DOMO.” Over the past 3 years he has been on several tours to China (over 30 cities), over 5 cities in Japan assisting, teaching and performing. His message? “Attitude makes all the difference. The right talent with the wrong attitude will get you nowhere. Jasmine Li started street dancing in 2003 in Taiwan. Influenced by various street styles, such as House, Locking, and Jazz Funk, she specializes in Hip Hop and Street Jazz. She started her professional career as a dancer and choreographer in 2007. She choreographed and performed at countless competitions, events and showcases, such as Red Bull BC One, Adidas fashion shows, and music videos and concerts, and constantly traveled to LA and Japan to train and grow as a versatile dancer. At 2011, she moved to Boston in pursuing her master degree, and actively participated in Boston dance scene and took workshops and conventions ever since. Her talent and passion in dancing has given her opportunities of being the scholarship recipient and finalist of Monster Show 2012 as well as joining various dance teams, such as Bosstown, CONcept ARTists, and ProNailz. 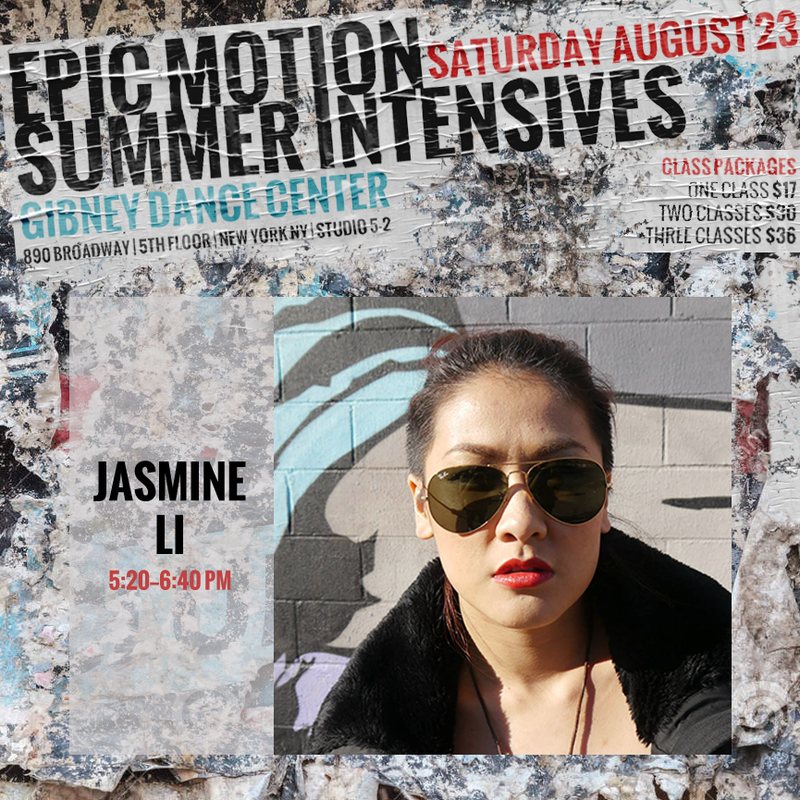 After moving to NYC in 2013, Jasmine didn’t stop dancing even work had occupied most of her time and energy. She focuses more on House and freestyling in hoping to explore more possibilities in expressing herself via different moves and vocabularies. Jasmine is excited to share her style and dance with everyone who loves dance as she does. Justin Conte was born and raised in NY. He began dancing at the age of 15, soon realizing he had found a safe place to learn and grow. Over the past eight years he’s been teaching and choreographing around the United States as well as internationally. After training in technique for six years, Justin was exposed to a variety of Street, Freestyle and native movement, sparking inspiration. He began training with world-renowned movers and choreographers Dana Foglia, La Jon Danztler, Joanna Numata, Brian Friedman, Sheryl Murakami, and many more. Shortly after meeting Dana, he joined Dana Foglia Dance. Exploring new movement and a deeper sense of self became necessary. Justin fulfilled his passion of teaching at Broadway Dance Center, as well as choreographing commercially for various recording artists traveling the U.S. He began his professional career understudying Tyce Diorio in the final regional production of A Chorus Line (Mike) before it returned to Broadway. Within the past few years, Justin has traveled internationally to Japan to work with the Tokyo, Osaka, and Fukuoka Schools of Music and Dance as well as a recent Europe teaching tour, sharing at famous studios in Berlin, Vienna, and Gothenburg. More recently, he danced on Seasons Four and Five of the hit Fox TV series Glee, and guest choreographed at The Pulse On Tour Summer 2014 Showcase. He has worked with recording artists Paula Abdul, Miley Cyrus, and Jordan Sparks, among others. Justin’s newest endeavors include creative direction, video production, and video editing for his up-and-coming production company, Pendulum Visual Art. He is currently working in both Los Angeles and New York City dancing, teaching, and sharing his movement at Debbie Reynolds, Movement Lifestyle, Millennium Dance Complex and Broadway Dance Center. 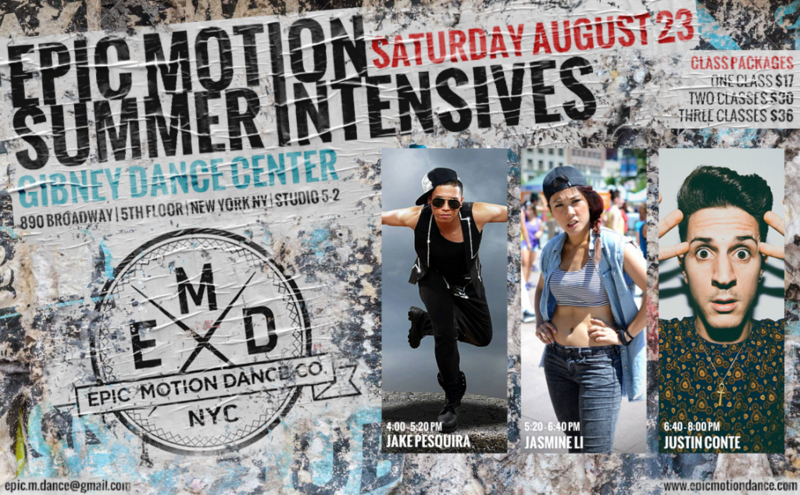 EPIC Motion Dance Company is excited to conclude yet another summer in the New York dance community with our highly anticipated Summer Intensives! Join us as we bring together some of the best from the East Coast. This year we will again be featuring three choreographers for one EPIC evening of dance! Don’t miss out! For more information about the choreographers in our lineup please read their bios HERE. EPIC Motion is seeking a new Videographer to work with us on a several projects during Summer 2014, with the possibility of an ongoing partnership during our 2014-2015 main season. The videographer will coordinate with our Marketing Director and Media Team to film and edit footage from our classes, workshops, and performances, as well as work on various promotional materials. The ideal candidate has experience working performing arts events and is open to collaborating with other creative minds. Photography skills are a plus! For examples of expected deliverables please visit our YouTube and Facebook pages. The videographer will receive project-based compensation with potential benefits including access to some internal company training classes and discounted merchandise. Please send your portfolio (formal or informal) to epic.m.dance@gmail.com with your weekend availability through August 2014. More information will be provided upon receipt.